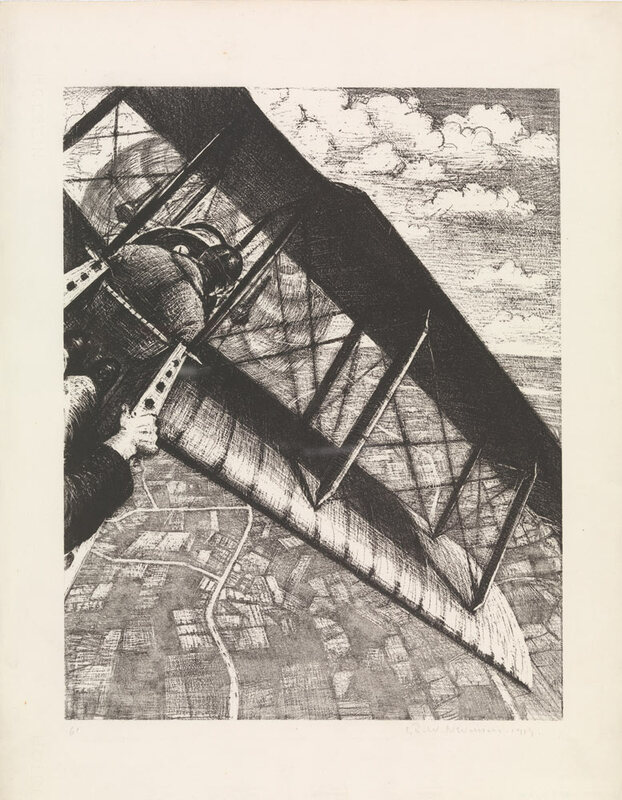 "World War I and the Visual Arts"
Christopher Richard Wynne Nevinson, Banking at 4,000 Feet (1917), lithograph, image 40.3 x 31.8 cm, sheet 51.1 x 40 cm. Metropolitan Museum of Art, Purchase, Reba and Dave Williams Gift, 1998. “World War I and the Visual Arts,” organized by Jennifer Farrell, associate curator in the Metropolitan Museum’s Department of Prints and Drawings, represented the Met’s main commemoration of the centennial of the American entry into World War I on 6 April 1917.1 But while it incorporates prints by George Bellows and the Japanese-American soldier and artist Kerr Eby, as well as drawings by John Singer Sargent, the show emphasizes neither American art nor the term of American involvement in the war. Instead, it explores artistic responses from both sides of the conflict, moving chronologically from mobilization and trench warfare to the armistice and the period of reflection in the decade after—and with a distinctive idiosyncrasy in the details. Supplementing the established canon of German artists (Max Beckmann, Käthe Kollwitz, Otto Dix and George Grosz) and the rather smaller one of Allied artists (of whom the best known is the British painter and printmaker C.R.W. Nevinson), Farrell included an unusual selection of prints along with illustrated books and periodicals, posters, trade cards, photographs and textiles; even more unexpected in the context of the museum’s prints and drawings galleries are the medals, trench lighters, helmets and gas masks—objects that provide a glimpse of the artifacts of war, which cannot be divorced from its arts. Many of the artists here would have depended on such things in their roles as soldiers, medics or official war artists. Ephemera installed throughout the exhibition by Allison Rudnick, the department’s assistant curator, supplied a sense of material culture on the home front: a group of nine chromolithographic postcards from several nations shows zeppelins looming cartoonishly over iconic landmarks, and two examples of printed cotton toiles de guerre from 1916, combining French patriotic and military motifs with a classical ornamental vocabulary.